This 4 ingredient Candied Bacon Bark will please both the sweet and salty snackers in your life. Super simple to whip up and something a little different to add to your baking list this holiday season. For the last treat of Christmas Cookie Week I’m bringing something super simple and chocolate-y with a sweet and savory spin. 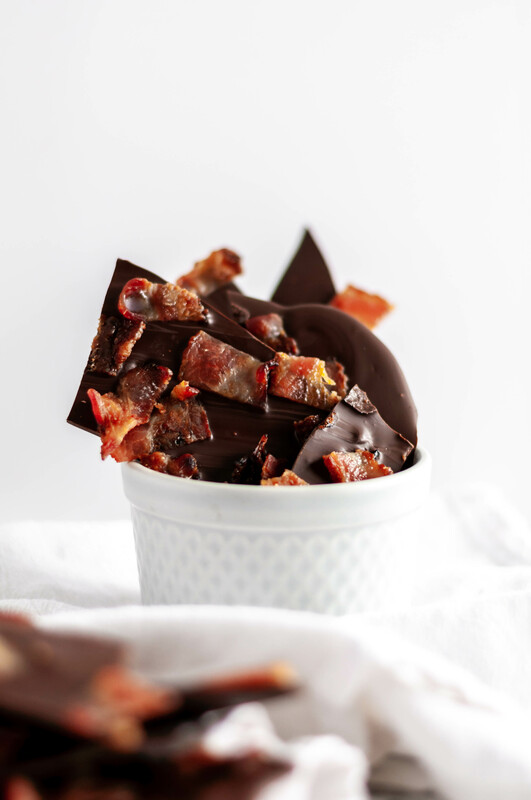 Candied Bacon Bark. Are you guys into the whole bacon on your sweets craze? I’m not big on the maple bacon combination but I can totally get behind this chocolate bacon situation. And I’m not even a big fan of chocolate so that’s saying something my friends. We can still be friends if I confess that to you right?! If I am going to eat chocolate, I’ll always reach for dark chocolate. I prefer the strong, bitterness of it over super sweet milk chocolate. And I really like the way it pairs with the salty bacon. Don’t worry about it not being a sweet enough treat for Christmastime though because the bacon is candied for a little hit of sugar. And all things are right in the world. If you haven’t made candied bacon before let me tell you how easy it is. First, the bacon get laid out on an oven safe rack with a foil lined pan underneath. Please if you listen to anything I say today listen to this. DO NOT skip the foil on the pan. As the bacon bakes the fat and extra sugar drips off and caramelizes/burns. It will take you days to get it off your pans if they aren’t foil lined. It will make you so very sad. Ok, back to the bacon. Brown sugar and a liiiitle maple syrup get mixed together to make a paste that gets spread onto the bacon. I’ve found the best way to get it all over the bacon is using your hands since it’s pretty thick and doesn’t cooperate with utensils or pastry brushes. Then it bakes in the oven until it gets all crispy and caramel-y and delicious. Once the bacon is cooked, let it cool for a few minutes while you melt and spread the dark chocolate. The bacon then gets chopped up, sprinkled over the chocolate and into the refrigerator it goes to let it harden. Break it into pieces and you’re done. There are so many flavors and textures going on through this bark with only 4 ingredients needed. The chocolate is creamy and bitter. The bacon has crispy and chewy bits. It’s salty and savory and slightly sweet from the candy process. If you have a bacon lover in your life (um, who doesn’t?!) you need to whip up a batch ASAP. Candied Bacon Bark is a super simple, 4-ingredient treat that is perfect for the bacon lover in your life this Christmas. A fun, different addition to your Christmas baking list this year. Preheat oven to 375 degrees F. Line a large baking sheet with foil. Place an oven safe rack on top of the baking sheet. In a small bowl, mix together the brown sugar and maple syrup. Spread it oven the bacon evenly (you will probably need to use your hands for this step). Place the bacon, sugar side up, on the baking rack. Bake for 25 to 30 minutes, watching closely once you reach 22 minutes. Remove from oven and let cool a few minutes. Line another cookie sheet with parchment paper. Set aside. Melt chocolate chips in a microwave safe bowl in 30 second increments, stirring after each time. Once melted, spread the chocolate on the parchment paper to about 1/4-inch thickness. Chop the bacon into bite size pieces and sprinkle over the melted chocolate. Place in the refrigerator and allow to harden for 15 to 20 minutes. Break into pieces. Keep refrigerated.